The Kintyre Forum • View topic - Photo's of Macharioch House? Re: Photo's of Macharioch House? 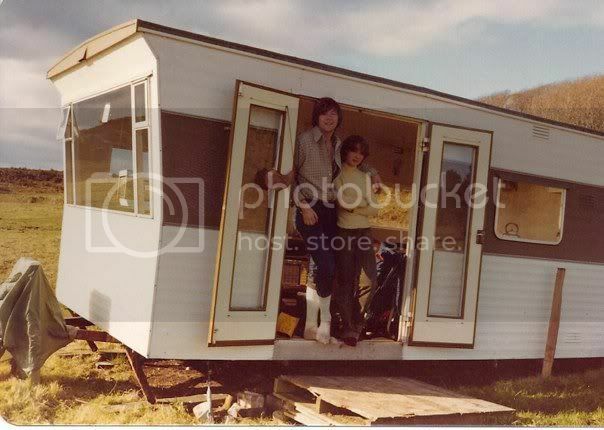 Here's a picture of me and a college friend staying in a caravan that the McCorkindales lent us when we arrived once without a place to stay. We traveled to Southend while on a Fall holiday from school in London. We, and please don't laugh, tried to spend the night in one of the caves but it seemed that a sick cow made it its last repose instead. I left my friends in the cave and trekked to the McCorkindales who were at that time living in the gatehouse and they showed typical Scottish hospitality by throwing open the doors of one of the beach caravans to us. It was like a palace. I will be forever grateful and I always strive to do the same to needy travelers where ever I am and when ever I can. I'll have to get scanning. I have some shots from Dunaverty Rock and Loch Gilphead from the same trip. I too lived with the original poster at Macharioch House so the above trip was all about tripping down memory lane. Great place to grow up. I also have some photos of Macharioch House. We lived there before the Nicholson family - from about 1954 to 1963. We went back there in September 1998 and the then owners Mr and Mrs Kelly & their son Hamish kindly showed us round. I can't see any obvious way to upload photos so it might take me a while to work that out. Venezia wrote: I also have some photos of Macharioch House. We lived there before the Nicholson family - from about 1954 to 1963. PM me if you need more assistance. My name is Gordon Baxter, i stayed at Macharioch when i was a child, with my parents. My father, either played cricket, golf or football with your father, i am not sure which or if it was a combination of all 3. My father was David Baxter, he played for Ferguslie and Queens Park. I am sure your mum will know if she is still alive. I am based down in England now but remember Macharioch fondly.